Journalist Kurt Greenbaum of Chesterfield, Mo., is using a blog to explore and archive a series of letters penned by his family during World War II. 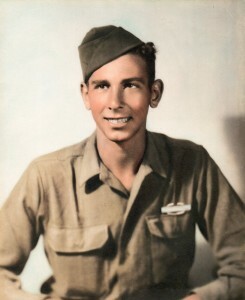 U.S. Army radio operator Frank D. "Babe" Mauro of Mount Kisco, N.Y., was eventually assigned to the Anti-Tank Company, 168th Infantry Regiment (168th Inf. ), 34th Infantry "Red Bull" Division (34th Inf. Div.). Babe would serve in both North Africa and Italy, and promote to the WWII-era rank of "technician fifth grade," a non-command rating also called a "tech corporal." To read the "Well, Happy and Safe" blog, click here. The blog also appears under that "Love, Honor & Support" blog-roll in the right-hand column of the Red Bull Rising blog. At one point, I think during a visit to my parents for Christmas, I made photocopies of all the letters, indexed them, and read them. In part, I was inspired because my grandmother had always stared at me, shaking her head at what she believed was the walking ghost of her son. I never saw the resemblance, but she did. In World War I, the U.S. 34th Inf. Div.—then nicknamed the "Sandstorm" division—comprised U.S. National Guard troops from North and South Dakota, Minnesota, and Iowa. The Midwestern connection continues to the present. The division headquarters is now part of the Minnesota National Guard, and is located Rosemount, Minn. Present-day units that notably continue to wear the "Red Bull" sleeve insignia include Minnesota's 1st Brigade Combat Team (B.C.T. ), 34th Inf. Div. (1-34th BCT), and the Iowa National Guard's 2nd Brigade Combat Team, 34th Inf. Div. (2-34th BCT). The 168th Infantry Regiment's lineage is currently maintained by the Iowa National Guard's 1st Battalion, 168th Infantry Regiment (1-168th Inf. ), headquartered in Council Bluffs, Iowa, and a subordinate unit to the 2-34th BCT. On Aug. 7, 1943, Babe wrote from North Africa: "The same old story; I changed my address again. At least, though, I finally got assigned to a regular outfit, and boy, what an outfit. It’s the best on this side and I don’t mean maybe. It’s got a history that dates way back to the Rainbow Division of the last struggle." The distinctive unit insignia (D.U.I.) of the 1-168th Inf. incorporates a rainbow element to this day. Happy well and safe.... fascinating letters! Thank you so much for taking the time to recognize my project and for your fascinating additional information. I might have to incorporate some of that into my own blog, so be on the lookout for that! And I'll be linking back here from my blogroll. Thanks again!